From minor control trips right down to compressor and transformer failures, harmonics can have an impact on every type of HVAC equipment. Surprisingly, harmonics is something that quite often can be overlooked. Harmonic currents flow in a circuit at multiples of the fundamental 60 hertz (Hz) frequency. For example, current flowing in a circuit at 180 Hz is the third harmonic (60 Hz multiplied by 3). These currents are not indicated on multimeters and therefore are usually not detected until unusual control and equipment problems start to happen. Comparing these current readings from an average-responding meter to that of a good quality true-rms meter on the same circuit will help in indicating harmonic issues. 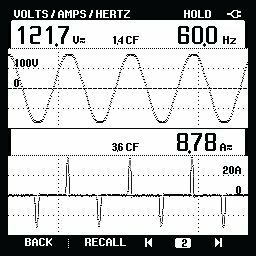 An average-responding meter will specify only the 60 Hz current, the true-rms meter can indicate a combination of 60 Hz and harmonic currents. It is now possible for professional technicians and engineers to isolate harmonic issues back to their source and then mitigate their effects by either replacing the problematic item or by installing harmonic filters. Modern electronic circuits must convert the supplied 60 Hz alternating current (ac) into direct current (dc) since the electronics operate using dc voltage and current. The waveform of the current drawn by these electronic loads reveals that the current waveform does not correspond to the voltage waveform applied. Thus, such electronic loads are referred to as “nonlinear” loads. These nonlinear loads produce the harmonic currents reflected back into the system. Harmonic currents appear across a wide spectrum, but generally diminish as the frequencies get higher and higher. See Figure 1. Figure 1. Nonlinear load. Observing one single-phase set of voltage and current sine waves drawn by a variable frequency drive (VFD) readily shows that the current waveform (lower) does not conform at all to the voltage waveform applied. Such nonlinear loads produce harmonic currents that flow into the distribution system. While different harmonic frequencies produce their own unique effect in a circuit, when combined they can distort the original 60 Hz sine wave. Distorted power at the input point to electronic equipment can create the erroneous trips and alarms that sometimes occur in control circuits. Some harmonic currents will produce excessive heat while other harmonics produce a reverse torque in motors therefore reducing efficiency and overheating motors. Measure with a clamp meter that is capable of indicating total harmonic distortion (THD). THD for voltage should not exceed 5 %. THD for current will run considerably higher. Use a power quality analyzer to further investigate the magnitude and effects of the individual harmonics. 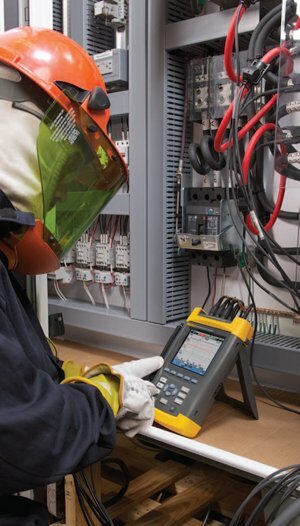 Power quality analyzers are available for both singlephase and three-phase circuits. In addition to measuring harmonics, power quality analyzers record other disturbances that can cause malfunction of control circuits. For example, “swells” are increases in voltage above the rated values and can damage equipment. “Dips” are decreases in the applied voltage and will causes spurious shutdowns and false alarms in variable frequency drive (VFD) and programmable logic controller (PLC) circuits. THD and harmonic levels should be measured at the point of common coupling (PCC) – the point at which the nonlinear loads suspected of causing the problem connect to the remainder of the distribution system. Look for THD for voltage approaching 5 % and check for the presence and the levels of different harmonic frequencies. See Figure 2. Figure 2. Harmonics. 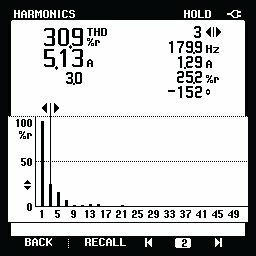 In this power quality analyzer screenshot, the harmonic frequencies appear on the harmonic axis. The percent to which the specific harmonic frequency is a component of the fundamental 60 Hz frequency appears on the vertical axis. The cursor has been placed over the third harmonic frequency, and this third harmonic current appears to represent approximately 25 % of the 60 Hz frequency. If you find excessive harmonics, review each case individually before making a decision on a course of action. You can buy harmonic filters and put them as close as is possible to the equipment that is producing the harmonic currents. You can consult the manufacturer of the equipment or an outside engineering consultant to recommend the most suitable harmonic filter for the problem. Another alternative is to isolate the problem equipment using an isolation transformer. Relocating either the nonlinear load causing the problem or the affected circuit to another distribution panel may help. For example, if the affected controls are supplied from the same panelboard as the nonlinear load causing the problem, moving the control circuit to another panelboard may help alleviate the problem. Harmonic problems tend to diminish moving farther away from the nonlinear load. Click here for further information on Understanding Harmonics, Troubleshooting and Measuring and Interpreting Harmonic Numbers. Minister Richard Bruton and Minister Charlie Flanagan Visit Powerpoint Engineering Ltd.